Yesterday, on October 29, RHS hosted its annual Halloween event, Project Pumpkin. Rockland citizens were able to come up to the high school with their children to trick-or-treat, venture down the haunted hallway, get their faces painted, and participate in other Halloween events in the gym. After all the hard work put into planning the event hosted by SGC and run by sophomore, Haley Nee and her committee, Project Pumpkin definitely accomplished their mission in spreading spirited Halloween fun for the community. The Veritas staff interviewed RHS students about their favorite candy, Halloween costume and their plans for Halloween this year! 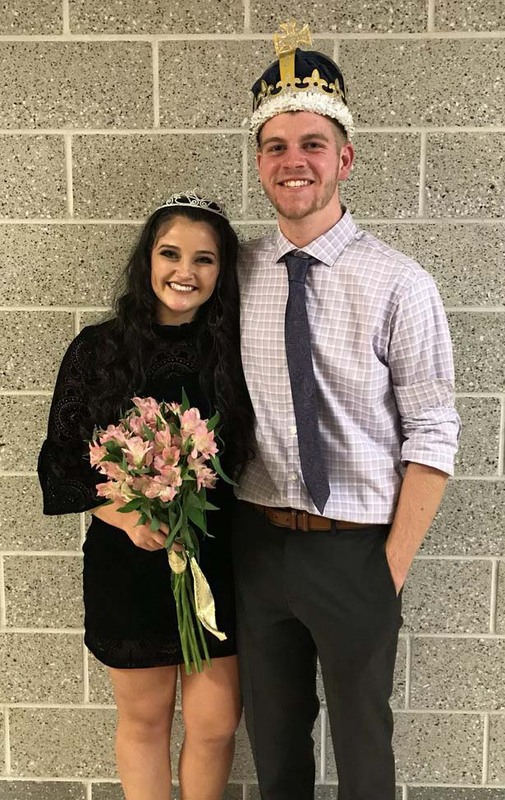 Veritas senior staffer Ryan Mott sat down with newly crowned Miss Rockland, senior Macie Jones and asked her about herself, her experiences in high school and what she plans to do in the future. After you watch the interview go here to see our photos of all the Miss Rockland nominees at halftime of the Homecoming game. Mr. Harrison crowns Lou Casey at the Mr. Rockland competition. photo by Jasmin Morse. Click on the photo to go to our photo gallery from the Mr. Rockland competition. The craziness of Homecoming Weekend has finally come to a close, the excitement and buzz is still filling the halls of Rockland High. Some of the most memorable moments from the past week was the crowning of Mr and Miss Rockland. On Wednesday evening, Oct. 18 in the RMS/RHS auditorium, after some stiff competition winner of the Mr Rockland pageant for 2017-2018 was Louis Casey. Participants included Aiden Glennon, Louis Casey, Jake Lauria, Joe Lauria, Chris Penney, Ronan McNally, Elie Chubik, and Joey Yeadon. After recieving the corwn, Casey was rewarded with a prime spot parking space, Chipotle gift card and a scholarship. On Friday, after the shortened class periods, students filed into designated areas per grade for class meetings. In these, each class discussed fundraising, class accounts, and what plans they have for the 2017-2018 school year. After that, students piled into the gym for Pep Rally. There, the band played, Julia Yeadon sang the National Anthem, and the cheerleaders performed their routine. On top of that, athletic awards were handed out, competitions between clubs and sports teams took place, as well as the highly anticipated Roller Coaster competition between classes. Principal Harrison awards the Miss Rockland crown to Macie Jones. Click on the photo to go to our photo gallery of all the Miss Rockland nominees. Miss Rockland was announced at half-time of the Homecoming Game on Friday night, Oct. 20. Chosen by the faculty and members of the senior class, Miss Rockland represents a positive role model and is involved in activities in the school and community. Nominated for the honor were seniors, Hannah Murphy, Jaymie Atkins, Lily Matson, Sydney McKenna and Macie Jones. Jones was selected as Miss Rockland for the Class of 2018 and will also represent Rockland High School in the Veteran’s Day parade. The Homecoming Game itself on Friday night was also a major success for the football team as well. The Dogs beat Middleboro in the 7 pm game in the Veterans’ Memorial Stadium 20-8. They will be kicking off playoffs next week at home against Cardinal Spellman. Natalie Draicchio and Chris Penney, queen and king of Homecoming 2017. 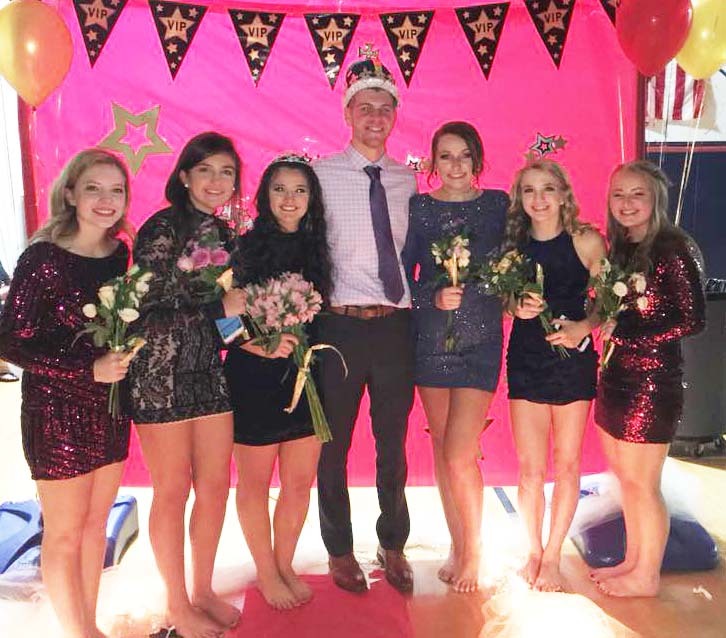 Finally, to close out the weekend, the Homecoming Dance was held from 7-10 pm on Saturday, Oct 21 in the RHS Gym. The dance had one of the largest attendance in recent years with over 200 students buying tickets. Because of this, the cheerleaders, the coordinators of the event, were able to open up the whole gym up for the dance. After such a momentous weekend, students are finally back in focus with their schoolwork. The Veritas’ Matt Dalton interviewed third place winner, Aiden Glennon and Mr. Rockland winner, Lou Casey after the Mr. Rockland competition on Oct. 18. Silvio Cordero Zapata was the cameraman. After this video, check out the full length WRPS video of the whole Mr. Rockland competition. Also click here to go to the Veritas photo gallery with photos of all the contestants. Veritas web editor, Jasmin Morse was the photographer. Get pumped for Pep Rally! Don’t forget! Tomorrow, October 20 is the annual, highly anticipated fall Pep Rally. The event is stacked with special performances by the band and the cheerleaders, class competition, and all out fun. Also don’t forget to go all out in your class colors. This year, the freshmen class’s colors are Carolina blue. The sophomores are decking out their class in white. The juniors will be a sea of red. Lastly, the seniors will be covered head to toe in black and gold. So don’t forget to represent your class by wearing your class shirts and class colors. As for the schedule, the Day 1 rotation will remain the same yet all classes will be cut down to 45 minutes. Mr. Harrison crowns Mr. Rockland Ryan Leavitt at Mr Rockland last year. As many Rockland citizens know, Mr Rockland is an annual event held at the RHS with senior boys who compete in a male pageant. The event is being held tonight at 7pm in the RMS/RHS auditorium. The admission is $5, although if you bring a can good you will receive a $1 off. Judging this year’s pageant will be math teacher, Mr Nicholas Liquori, history teacher, Ms Amanda Lanigan, guidance counselor, Mr Christopher Devine, and principal, Mr John Harrison. Competing in the pageant are Aiden Glennon, Louis Casey, Jake Lauria, Joe Lauria, Chris Penney, Ronan McNally, Elie Chubik, and Joey Yeadon. At stake is a prime spot parking space, Chipotle gift card and a scholarship. Come support the senior boys tonight!